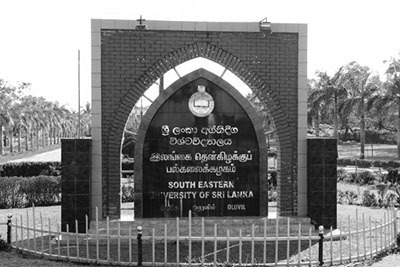 An engraved "Logo" of South Eastern University of Sri Lanka was presented to the Vice Chancellor Prof. MMM Najim at his Office by the Workshop Engineer MSA Zabry on Friday ( 12th August) in the presence of the Staff of the Office of the Vice Chancellor. Eng.Zabry says that this was the collective efforts of his Staff and this engraving work was completed in just 10 days. Vice Chancellor Prof. Najim who was highly impressed of his works encouraged him and his team to continue such novel projects.